Another very difficult day to trade unless you got ahead of it by being short yesterday and were brave enough to hold on for the ride! The DOW finished down 242 points, the S&P was down 2.3%, the NDX finished lower by just 1%, and the RUT diverged lower with a 3.3% loss. Dec. 9 (Bloomberg) -- Treasuries rose, pushing rates on the three-month bill negative for the first time, as investors gravitate toward the safety of U.S. government debt amid the worse financial crisis since the Great Depression. Yep, “lowest since 1929” pretty much sums it up. Volume on the day was slightly less on today’s decline than on yesterday’s rally except on the transports which fell 5.6% today on heavier volume. IYR and REITS also got hammered today, SRS was up nearly 13%. The VIX rose only slightly, finishing at 59, up .7%. Technically today is actually still working symmetrical to wave ‘a’… although barely. From a time perspective we need to rally tomorrow for it to continue. 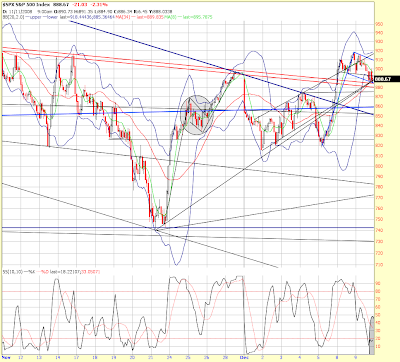 Below is a zoomed in 30 minute SPX chart. Note the circle I dropped into the chart on the left. It is highlighting the smaller b wave within wave ‘a’ up. Note how it became a flag with a mast that carried higher. Usually the target for a flag is the length of the original mast, so wave ‘a’ fell short of that. Now go to the right and you will see a blue flag I just drew in. That is a POTENTIAL bull flag. That mast is 100 points long, so you would expect a target up around 988, but I doubt it gets there on this next leg up IF THAT’S THE DIRECTION IT HEADS. No I’m not certain enough to go large money at that! In fact, I still think this is a terrific time to sit and watch. Case in point, look at what happened when Fedex warned and lowered guidance. The transports got creamed, that’s the risk in playing counter-trend. Frankly, I see the case for both bearish and bullish moves here, so again, my experience is yelling at me to play small or not at all. There is a time to take risk, and that time is not in the middle of cross currents. This next chart is an expanded version of the same 30 minute SPX chart. 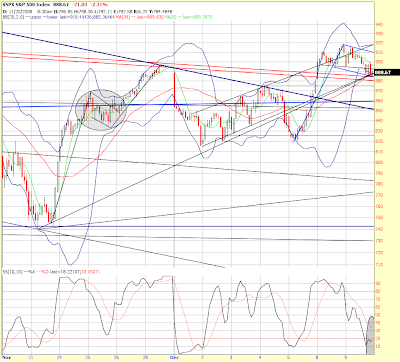 As you can see on that chart, the 30 minute stochastic is oversold, as is the 10 minute. The fact that 885 held shows that the old upsloping line off the December 2nd bottom is still in play. Also note how the neckline of the inverted H&S pattern (double red lines) stopped today’s decline. That may have been the classic "kiss" back. 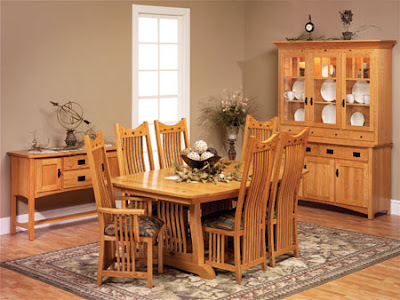 I liken this to the market just making sure it REALLY means it! This was probably a decent long entry as that neckline is a good place to use as a stop. If it goes below, get out of the position… or play short. It’s a line of demarcation, but for me I’m taking a pass for now. Busy chart, I know… there’s a lot happening – cross currents!